These two Jet Trails quilts have been selected to be judged at the Mid-Atlantic Quilt Festival in Hampton, VA, and will be displayed from February 26 - March 1, 2009. 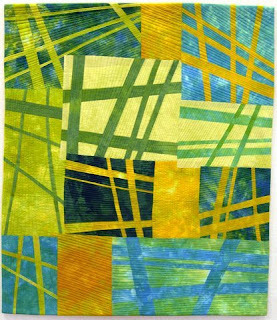 This piece (24" x 27"h) will be in the Wall Quilts section. And Jet Trails #6 (46" x 64"h) will be in the Innovative Quilts section.